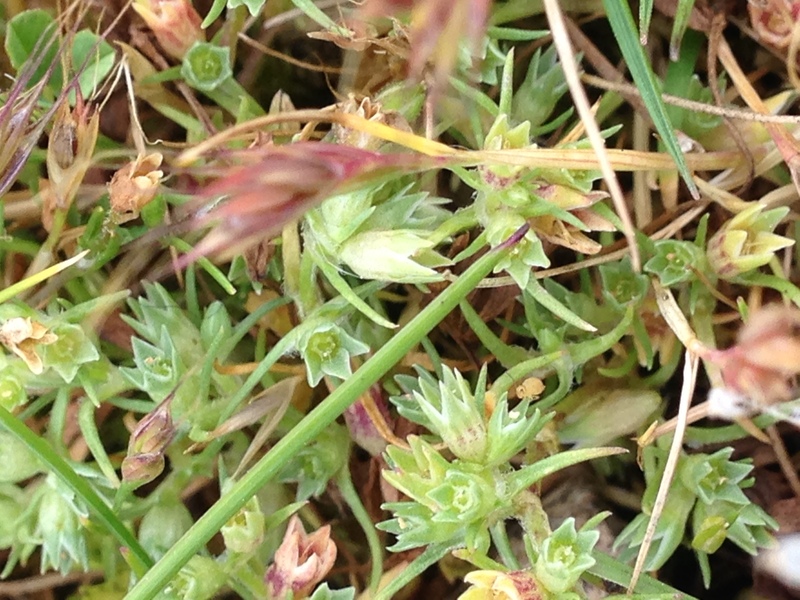 We (Judy Clark, Ellen Campbell and Jacqueline Rose) have spent literally hours hunting for and failing to find Scleranthus annuus (Annual Knawel) around Camber Castle at Rye Harbour. Helen Proctor was the last person to record it there, in 1999. Pictorial field guides don’t give a very clear idea of what to look for, so when we found two patches of an unfamiliar plant, looking rather like a combination of the flowers of Aphanes arvensis (Parsley Piert) and fruiting Montia fontana (Blinks), on a road verge just eastwards of Jury’s Gap, it took a moment to realise that it was the elusive plant that we had been seeking for so long — Scleranthus annuus. It was exciting enough that there was no previous record of it in TQ91Z. Even more thrilling, when Judy and I examined our tiny specimens we realised from the account in Stace that we had almost certainly found the rare sub-species polycarpos. Matthew Berry advised contacting Dr Fred Rumsey of the Natural History Museum, who was able to confirm it from a photograph and the measurements. He was rather pleased to have the record as he is currently leading a study into the distribution of this sub-species! The fruit is an achene, within a persistent calyx. There are no petals. The differences between the two subspecies are in the length of the calyx: >3.2mm in subsp. annuus and 2.2–3mm in subsp. polycarpos – and the behaviour of the sepals when the fruit is ripe, which diverge in subsp. annuus, and are parallel or convergent in subsp. polycarpos (hence the resemblance to Blinks). It was yet another exciting plant to find on this wonderful verge, which lies between Jury’s Gap Road and the fence of the Lydd Ranges. Trifolium suffocatum, Teesdalia nudicaulis, Moenchia erecta, Saxifraga tridactylites and Vicia lathyroides (Suffocated Clover, Shepherd’s Cress, Upright Chickweed, Rue-leaved Saxifrage and Spring Vetch) are just a few of the species which find the thin sandy soil and lack of competition exactly to their liking. The verge is within the Dungeness, Romney Marsh and Rye Harbour SSSI area, but as yet we do not know who owns it. 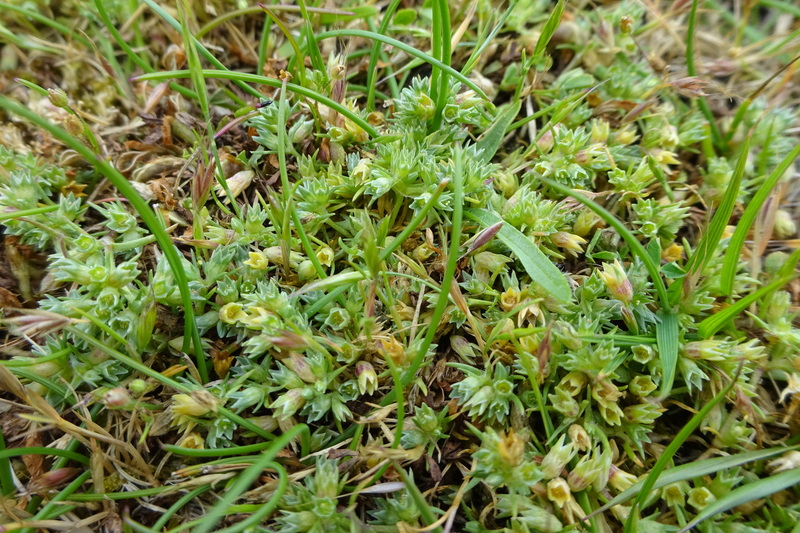 Because of its diversity and preponderance of species rare in Sussex it is really important to ensure it is not subject to any detrimental management.